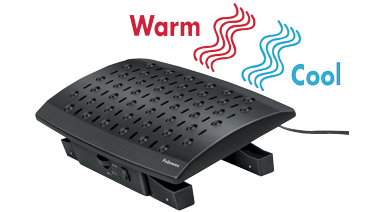 Versatile footrest with climate-control fan for airflow. Heater radiates safe, even heat on low or high settings. Auto-off feature turns unit off when not in use. Features 2 height adjustments from 5" to 6" and adjustable tilt from 5°, 14° or 20°. Massage bumps to help relieve stress. 17"W x 10"D x 5-1/2"H. 2.1 amp. 250 watts.